“Revenue Neutral” Carbon Tax? Not So Much. The House Energy and Technology Committee had a chance to ask the creators of a Carbon Pricing study some questions today. One of their findings that is not particularly shocking is that if the tax is “revenue neutral”, meaning that all tax revenues raised are returned (although redistributed) to the taxpayers via alternative tax cuts or rebates, it doesn’t do a whole lot to curb behavior. If the tax costs you an extra $15 to fill up your tank, but then you get a rebate check for $15 dollars, you’re probably not going to drive any less. The report writers conceded that a revenue neutral approach would not have the kind of impact on greenhouse gas emissions supporters of the Carbon Tax want. Enter Representative Michael Yantachka (D-Charlotte), who quickly floated the obvious solution: rather than use the revenue to cut other taxes or provide rebates, government should just keep the money and spend it! Yup, that didn’t take long. In Yanchachta’s words, “With the amount of rebate they [Vermonters] can get on their electric bill, they’re not going to be investing any of that into anything that will help them reduce their greenhouse gas emissions like weatherization or buying an electric vehicle…. If we put a 15 cent per gallon price on carbon, we can take that money and help people do good things.” Translation: You may have earned that money, but we know how to spend it better than you. Yanchachta also implied that a 15 cent a gallon tax on gas and home heating fuel wouldn’t be a big deal, even for low income Vermonters, because these prices can and sometimes do fluctuate more than that organically. Yes, they do. And when those prices fluctuate up, it hurts. A fifty cent spike in gas prices will hurt a lot more when it’s 65 cents because of an additional 15 cent tax. Seriously, how hard is this to understand? 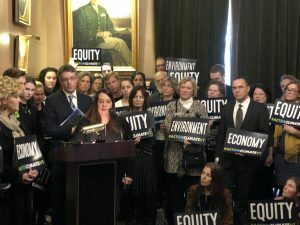 Nevertheless, the sentiment was echoed later in the Cedar Creek Room where a coalition of environmental activists offered up their “Climate Action Plan for 2019.” This fourteen-page pamphlet is chock full of ways to spend revenue from a new Carbon Tax, including a doubling of Vermont’s weatherization program, creating subsidies for buyers of electric vehicles, and further subsidizing renewable energy. If anyone ever bought the notion that a Vermont Carbon Tax would be “revenue neutral”, or, if passed as such, would stay that way for very long, today’s State House activities should put that fantasy to bed for good. These people need to go to Amazon and order a couple of the many books that debunk the idea that carbon is causing climate change. They aren’t going to save the world, they are just going to destroy the economy of Vermont and the lives of many Vermonters. Come on stop nickel and dining ,ignoring and taking advantage of the hardworking VT tax payers ! You can only barrow Fram Peter to pay Paul for so long before Peter goes broke and belly up ! of Climate change, this earth has been here for billions of years and now all of sudden you want us the people to believe the earth is coming to a end if we don’t support your idea of such claims, Here is a thought invest in our education so our taxes will go down, haha like that will ever happen. The real problem with this or any other tax is once it becomes a reality, what’s to prevent it from rising if the Dem/Lib/Progs need more funding for another feel good program? I wish it wasn’t Vermont (my home state and now neighbor state), but I have to say I kinda wish they would quit haggling over it and just do it up good – everything on their wish list – so the consequences would be quickly and glaringly obvious. Maybe that would wake these people up. Maybe… I don’t know… Sometimes I wonder… It seems like logic and reality escape these folks. I wonder how long it would take for Vermont to implode. Sorry, friends over there, but it is torture to see Vermont slowly going down the drain. Since your representatives are so far gone, I just wish something would happen to shake them up and bring some sanity back into the picture. When I was in second grade in the mid-70s, I vaguely remember something about global cooling. That isn’t mentioned much these days, is it? A carbon tax hurts Vermont’s citizens least able to afford an extra payment for anything, in particular subsidizing the rest of an uncooperative world in cleaning its air. In a manner of speaking those of us least able to afford such luxuries have been paying for it for several decades through stagnant wages. Wages that began to stagnate because of the real increased costs presented to employers through the Environmental Protection Act of 1970. Was this a good idea, sure, ask anyone in Boston back then what the Charles River was like in 1960 and the answer would be “a sewer”. What’s it like now, pretty clean, the first public swim since recreational swimming in the Charles was banned in the 1950s was held in July of 2013. Compare current Bejing on a bad day to Los Angeles on a bad day, with visibility nil and people with face masks. There may have been people with face masks in 1970 Los Angeles but not in 2018. Part of the reason our air is cleaner and breathable in the cities is because of improvements to automobile exhausts. An average full sized car in 1957 cost new about $1950 which is $17,500 in constant 2018 dollars. That’s about 55% of what the average full sized vehicle costs in 2018. Why is that, capital market forces control prices for the most part over the long run and certainly 60 years is enough time. The answer is that we have much better and safer automobiles because of regulations that have progressed at an affordable pace. When that pace of affordability gets out of control the market forces push back: example the most recent rollback of regulations for an inspection sticker in Vermont. Overall though, it’s great progress, those examples above were doable, but burdening the population of Vermont, 0.01% of the world’s population, or others in various countries, to handling this problem is not doable in the short time span prescribed to do it. The people of those countries that have enacted a Carbon Tax prescribed with an unaffordable pace and thus unaffordable price, are now pushing back. If you are of the mind that you as an individual have not done enough to thwart the advance of pollution then do something about it personally, don’t put the burden back on those of us who can least afford it. Downsize your massive homes, turn down your thermostats, restrict your daily driving habits or downsize your cars, and stop taking vacations so far away that you have to fly there, stay in Vermont. I did that a long time ago by necessity, stagnant wages, remember.